GramLine® offers optional fencing accessories that complement and add to the appearance of your home and surroundings. Complete your GramLine® fence with a range of accessories that can be mixed and matched from the wide range of colours available. The Channel Post & Smart Post® Extensions allows you to add a perfect decorative addition to your existing GramLine® fence. These Extensions allows you to add height to your existing fence or just add a decorative touch on top of your fence using our GramLat® 3D Lattice™. The GramLat® 3D Lattice™ is the perfect decorative addition option available as an extension that can be added to your existing fence. It is a stylish and durable way to add privacy and security while also allowing the light and breeze to filter through. The Coloured Plastic Double End Caps are an optional accessory for your steel privacy fence. These plastic caps are basically a cap that sits on top of your Smart Post® or Channel Posts. It comes in the full GramLine® Steel Privacy Fencing Colour Range. This little addition neatly finishes the look of your fence. 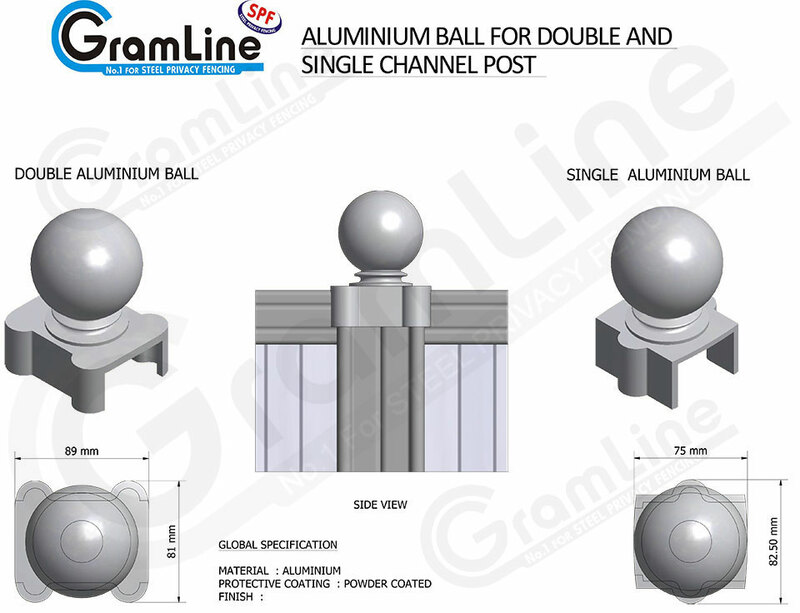 GramLine® allows you to make more of a statement by adding the Decorative Aluminium Balls on top of your GramLine® Smart Post® or Channel Posts. These are powder coated in all the full Gramline® Steel Privacy Fencing Colour Range. Coloured Aluminium Balls are designed to fit superbly on GramLine’s Smart Post® and Channel Post, 50sq, 60sq & 64sq posts. GramLine® gate kits and gate accessories are designed to perfectly complement our GramLine® and ColorLine® fencing profiles. There are a large range of gate sizes, gate combinations and gate accessories available. Complement your steel privacy fence with matching single, double and sliding gates.